Mandoo or Mandu are traditionally consist of minced meat and vegetables wrapped in a thin piece of dough. This Korean dumpling recipe is easy to make and can be prepared in advance in large quantities and freeze them for future use. Mandoo can be boiled, steamed, deep fried, pan-fried or added to soup. Mandoo are usually served with a dipping sauce made of soy sauce and vinegar. Related Recipe – How to make Soon Kueh. In a large bowl, gently combine meat, onion, cabbage, tofu, and noodles. In another separate bowl (seasoning mixture), combine garlic, sesame oil, soy sauce, salt, and pepper. Dip your finger in water and wet the outside edge of the top half of the wrapper. Fold the wrapper up to close and then crimp the edges. Repeat steps until the filling is used up. You’ll want to try to steam, boil, fry, or saute the dumplings as you wish. Serve tasty dumpling at your family birthdays or holiday gatherings. 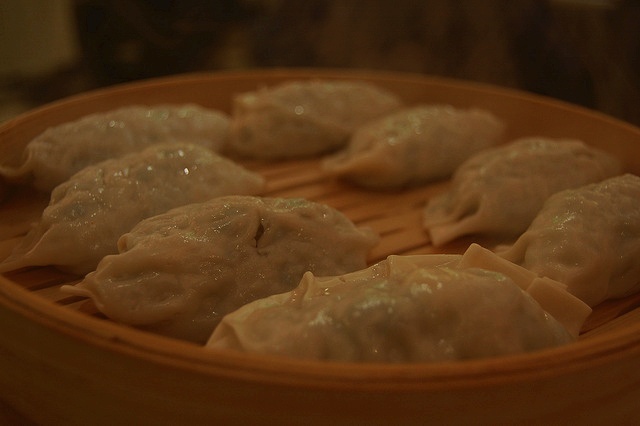 great dumpling recipe…i like it steamed! I’m surprised that you managed to close the dumpling wrap with that much meat! =) But hey, we all love mega-stuffed dumplings with lots of goodies inside.